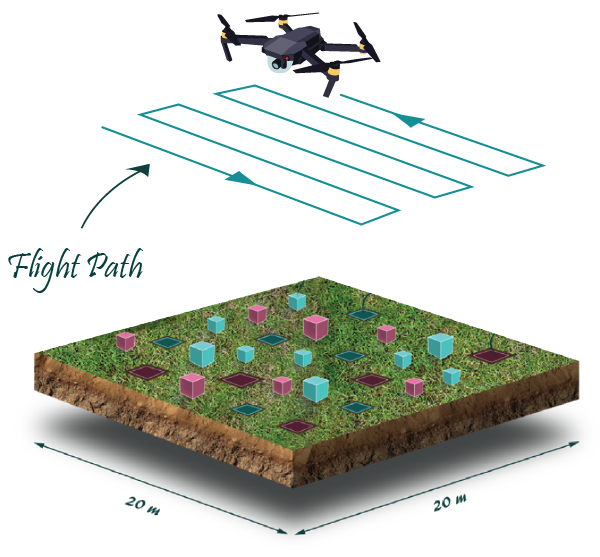 Search for surface-laid and buried metallic and minimum metal objects of different dimensions and shapes using teleoperated or an autonomous ground/aerial vehicle. These objects mimic the anti-personnel landmines and unexploded ordnances. The vehicle has to able to navigate through rough environment that mimics a real minefield. Automatically produce a high-precision map for the locations of the detected objects without human intervention. Identifying the types of the detected landmines. Collecting and moving the detected surface landmines to a built-in container or to a designated area outside the competition arena using a teleoperated or autonomous grasping mechanism. The competition arena will be an area one of grass or desert land with a size of 20mx20m, will be marked only by plastic tape for visualization purposes to stop the robots from going outside the competition area, there will not be any flags or lines in the arena . 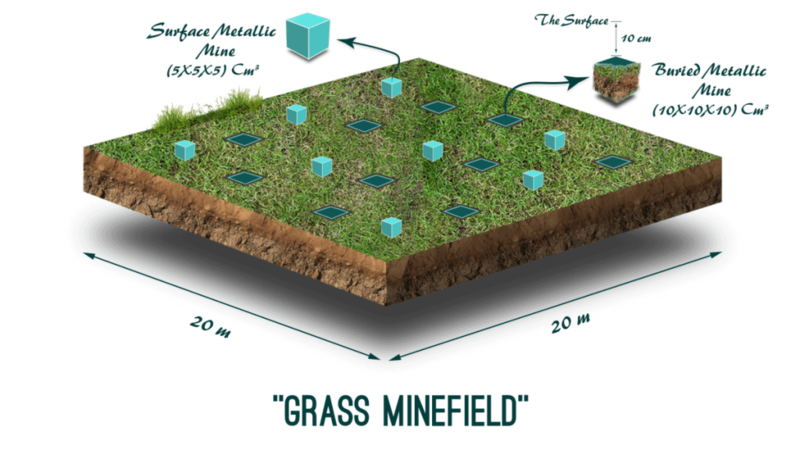 The arena will be have Buried Mines: These mines are made from metallic and non-metallic shapes, with different dimensions up to approximate dimensions of 10x10x10 cm3 (LxWxD). These mines are completely buried underground with maximum depth 10 cm. Surface Mines; will be black metallic and non-metallic shapes are used to simulate above ground mines and unexploded ordnance (UXOsThe location of the surface mines will be changed every match) with different dimensions. For more details and score sheet check the Rule Book. 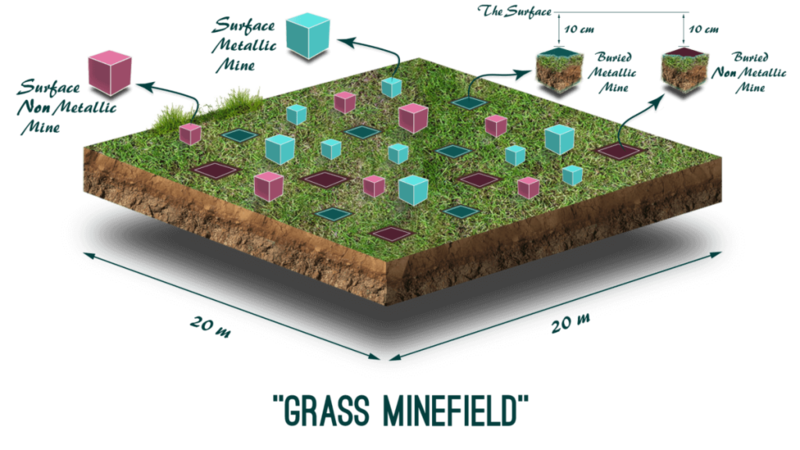 Search for surface-laid and buried metallic objects of a cubical shapes using teleoperated or an autonomous ground/aerial vehicle. These objects mimic the anti-personnel landmines and unexploded ordnances. The vehicle has to able to navigate through rough environment that mimics a real minefield. The competition environment will be an area one of grass or desert land with a size of 20mx20m, will be marked only by plastic tape for visualization purposes to stop the robots from going outside the competition area, there will not be any flags or lines in the arena. 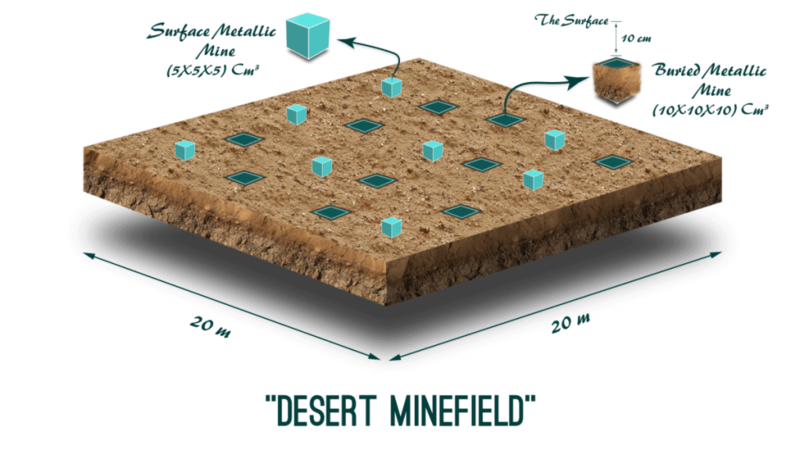 The arena will have Buried Mines: These mines are made from metallic cubes, with approximate dimensions of 10x10x10 cm3 (LxWxD). These mines are completely buried underground with maximum depth 10 cm. 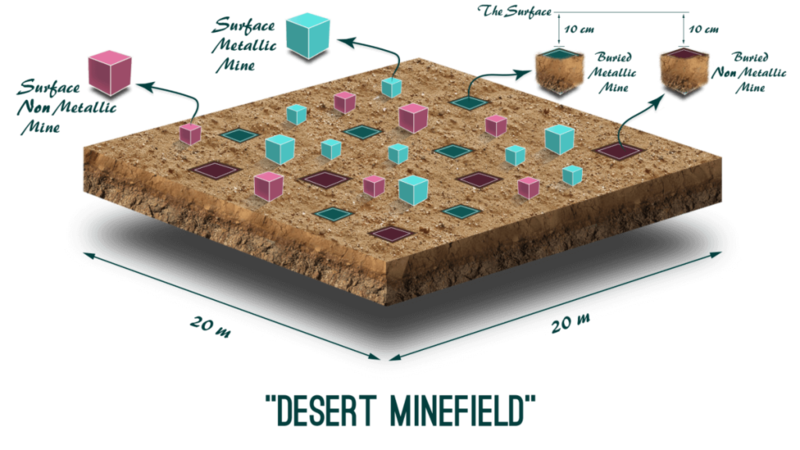 Surface Mines; will be black metallic cubes are used to simulate above ground mines and unexploded ordnance (UXOsThe location of the surface mines will be changed every match) with approximate dimensions of 5*5*5 cm3 (L*W*D). The competition environment will be an area one of grass or desert land with a size of 20mx20m, will be marked only by plastic tape for visualization purposes to stop the robots from going outside the competition area, there will not be any flags or lines in the arena. The arena will have 埋地雷: ：这些地雷由金属立方体制成，尺寸约为10x10x10 cm3（长x宽x高）。这些地雷 完全埋在地下，最大深度为10厘米。 Surface Mines; will be black metallic cubes are used to simulate above ground mines and unexploded ordnance (UXOsThe location of the surface mines will be changed every match) with approximate dimensions of 5*5*5 cm3 (L*W*D). To participate in the competition with ROS you must build the software of your robot system using Robot Operating System (ROS). MRS can play a crucial role in humanitarian demining. According to the Standard Operating Procedures (SOPs) for humanitarian demining, human deminers use metal detectors to identify targets, which are then flagged for subsequent digging by a supervisor. The objective of this category is to mimic the conventional mag-and-flag approach or SOP using multiple unmanned teleoperated and autonomous vehicles. The arena of the competition is shown in the following figure. Teleoperated vehicles play the role of human deminers while an autonomous vehicle is used to mimic the supervisor/team leader’s role. The team leader has to be equipped with a gripper or a marking mechanism to mark the location of the landmine detected by the deminers. More than one deminer can be integrated into the team but only one supervisor or team leader is allowed. If two deminers are used, these unmanned vehicles “A” and “B” are assigned to each lane as shown in the figure. Vehicle “B” starts to work after vehicle “A”. If a deminer detected a surface-laid or a buried mine in its assigned lane, it has to produce a warning siren for at least 2 seconds and inform the team leader about the position of the detected mine. All the deminers have to stop and wait while the autonomous vehicle (the team leader) comes forward marks the detected mine with a red mark or flag and the scanning procedure continues until the entire arena is scanned. UAVs/ Drones are allowed to be used in the competition to do the same tasks like the teleoperated or autonomous robots in all categories but if the team uses UAV, it will have 20% bonus score additional to the main missions score.